“Insurance is boring,” said no one in their right mind, ever. We know you agree when we say insurance, and claims in particular, is a dynamic, challenging industry, with endless opportunities to innovate and change lives. Here at Claims Magazine, we feel inspired daily by the work you do, and at the heart of the America’s Claims Event is the desire to celebrate and share that exhilarating feeling. In keeping with this, we are thrilled to invite you to participate in the ACE Awards – our chance to gather as an industry, recognize the standout work of you and your peers, and party together as only claims professionals know how! We are seeking a strategic claims leader who has made large contributions toward effective, efficient and customer-supportive claims operations at their organization and the industry in general. This individual understands the value of sharing knowledge, promotes education and professionalism in the claims industry, exhibits ethical standards and demonstrates a thorough knowledge of the claims process. We’ll scour the nation for an insurance claims or carrier organization that has made significant, progressive contributions to the claims industry by introducing new products or innovations to improve the claims process for insurers and/or policyholders. This is our Trailblazer. Open to adjusters, insurers and third-party administrators only. 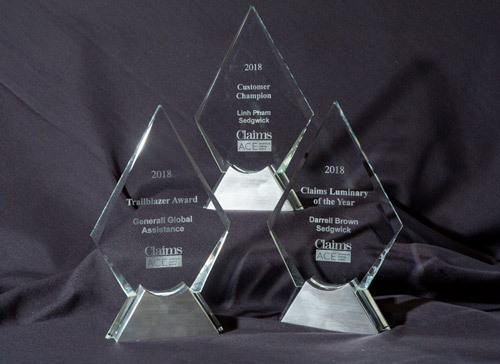 The Customer Champion Award belongs to the claims professional or individual in an affiliated industry who has gone above and beyond to serve their customers in a way that provides a seamless, supportive experience in what is often a stressful situation. Join us at ACE when we recognize our champion, and be ready to raise a glass!